A parish doesn’t just communicate its mission from the pulpit. Teaching and preaching also happen in classes and small groups, in bulletins, on the church website and social media, and through volunteers who welcome visitors through the doors. In Rebuilding Your Message, Fr. Michael White and Tom Corcoran, award-winning authors of the bestselling books Rebuilt and Tools for Rebuilding, share dozens of strategies to help priests, staff, volunteers, and parishioners establish and sustain excellent communications in Catholic parishes in order to better proclaim the irresistible and life-changing Gospel of Jesus Christ at every level. Every Catholic knows that life in the parish could use a little energy boost. That's why Tom Corcoran and Fr. Michael White have created "Rebuilt" (rebuiltparish.com). 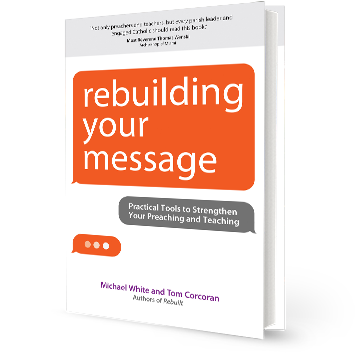 Their latest book in the series entitled, "Rebuilding Your Message" focuses on effective and integral communication at the parish level. Any priest and any parishioner can pick up this book and learn something practical from it, from strategies for using social media to communicating a welcoming atmosphere at church. The key: teamwork, a little humility, and remember that, in the end, YOU are the message. Fr. 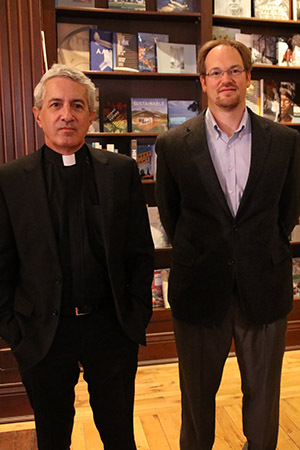 Michael White received his bachelor’s degree from Loyola University Maryland and his graduate degrees in sacred theology and ecclesiology from the Pontifical Gregorian University in Rome. After being ordained a priest of the Archdiocese of Baltimore, he worked for five years as personal secretary to William Cardinal Keeler, who was then archbishop. During that time, he served as the director of the papal visit of Pope John Paul II to Baltimore. During his tenure as pastor at Church of the Nativity, the church has almost tripled in weekend attendance from 1,400 to over 4,000. More importantly, the commitment to the mission of the Church has grown, evidenced by the significant increase of giving and service in ministry. Thomas Corcoran received his bachelor’s degree from Loyola University Maryland and completed his graduate work in theology at the Franciscan University of Steubenville. Corcoran has served Church of the Nativity in a variety of roles that give him a unique perspective on parish ministry and leadership. Beginning as a youth minister, Corcoran later held positions as coordinator of children’s ministry and director of small groups. He currently serves in the position of associate to the pastor and is responsible for weekend message development, strategic planning, and staff development.